Suggested Use: 1 to 4 capsules daily as a nutritional supplement. Accelerated fat metabolism and increased endurance during exercise. Oral dosages of 1-3 g/day have been used in clinical trials for various medical conditions. In Alzheimer’s studies, for example, a typical dosage would be 500 mg taken three times per day. Much higher doses have been studied informally as an anti-aging treatment, with no ill effects. Anyone who is considering the use of ALC for treating or preventing Alzheimer’s, Parkinson’s, or other neurodegenerative disease, should also consider the simultaneous use of a curcumin-containing product like LifeLink’s Primeric™, which also has neurological benefits. The combination has great synergistic potential. Acetyl-L-carnitine (ALC) is a biochemical substance made by all organisms except bacteria. Every cell of every plant, animal, yeast, mold, mushroom, and protozoan makes acetyl-L-carnitine molecules and uses them in the extraction of energy from fats. In the body, ALC and L-carnitine are interconvertible. take advantage of the energy contained in dietary fats. A fat molecule typically consists of three fatty acids bonded to a glycerol bridge. The process of breaking down fats starts with enzymes that pull the fatty acids off of their glycerol bridges. The free fatty acids are then sent to subcellular organelles called ‘mitochondria’ for further processing. Mitochondria, however, are bounded by a protective barrier — a double membrane that prevents inappropriate molecules from entering and disrupting the specialized processes that take place inside. Even appropriate molecules may require assistance in passing through this barrier. In particular, many of our dietary fatty acids (the longer-chain ones) are unable to enter a mitochondrion in their free form. To enable long-chain fatty acids to pass through this barrier, cells ‘tag’ them with a carrier substance called ‘L-carnitine’ — an enzyme attaches a molecule of L-carnitine to each fatty acid. A transporter protein in the inner membrane will now recognize the carnitine-fatty-acid construct and allow it to pass through the membrane into the interior of the mitochondrion. Once a fatty acid molecule is inside the mitochondrion, its L-carnitine tag is stripped off and the fatty acid is taken up by a processing complex that breaks it into small pieces, exposes the pieces to oxygen atoms, and siphons off the energy released during the resulting chemical reactions, storing it for future use. What happens to the L-carnitine tags? Some of them are directly transported back out through the mitochondrial membranes into the cell-at-large; these are now ready to transport more fatty acid molecules into the mitochondria. Others of the L-carnitine molecules are converted to acetyl-L-carnitine which is efficiently ferried out of the mitochondria by membrane proteins. Thus, acetic acid molecules use L-carnitine to ‘hitch a ride’ out of the mitochondria so that they can be used in the many ‘acetylation’ processes that take place in cells. Once outside the mitochondria, acetyl-L-carnitine can be deacetylated back to L-carnitine for reuse as a fatty acid transporter. Accordingly, we will limit our discussion of acetyl-L-carnitine to a brief summary of relevant research, and let you draw your own conclusions about what medical conditions it may be effective in treating. biochemical feedback loops that stray from stable patterns. These (and several other fundamental causes of aging) take place throughout the body, and they affect all the structures inside and outside the cells. Among the structures they affect are the mitochondria — the subcellular organelles that extract energy from fats and carbohydrates. As mitochondria extract energy from these substances, they store the energy in the form of ATP molecules, which are distributed to all parts of all cells in the body. As cells age, their mitochondria age. The mitochondrial membranes develop skewed proportions of the various molecules they are made of — particularly the lipid molecules which are made from fatty acids. This disrupts the functions of complex nanomachinery which resides in the membranes. Some of these nanomachines transport molecules into and out of the mitochondria; others perform the actual extraction of energy from broken-down fats and carbohydrates, and channel this energy into the production of molecules of ATP. Thus, a skewed membrane composition causes disrupted nanomachine function, which leads to a defective transport of raw materials and to a decline in ATP production. As the transport system fails and the wrong kinds of molecules are allowed into the mitochondria, the composition of the membranes becomes even more skewed. The energy-extracting nanomachines are forced into non-optimal positions in the membranes and they become less efficient; an increasing percentage of the energy they produce is wasted instead of being stored; and the mitochondria, and the cells they belong to, become starved for energy. The wasted energy is simply dissipated as heat instead of being used for maintaining biological structures and for enabling damaged cells to be replaced. 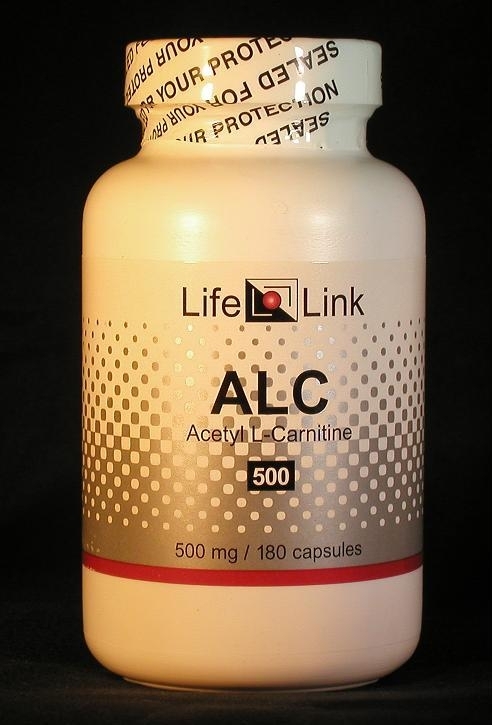 The current view is that ALC supplementation increases the amount of L-carnitine available for tagging fatty acids in cells. This, in turn, alters the distribution of fatty acids transported into mitochondria. A better fatty acid mix restores the proper proportions of lipid molecules in the mitochondrial membranes. With an improved membrane environment, the nanomachines embedded in the membranes perform better. As a result, the efficiency of energy production in mitochondria is enhanced, enabling more of the energy extracted from food to be stored as ATP instead of being wasted as heat. The subject is too complex to describe here in more detail than this, but the ‘bottom line’ is that ALC rejuvenates mitochondria, and the boost in useful energy that results from this enables cells to behave more youthfully, too. Since ALC plays a central role in the production of energy in cells of all kinds, an increase in ALC availability would be expected to ameliorate many different kinds of ailments that involve cellular energy deficiency or impaired fat metabolism. Athletic individuals could reasonably expect that ALC consumption would lead to accelerated fat metabolism and increased endurance during exercise. But ALC also has effects that seem to be independent of its involvement in energy production. For example, ALC enhances the production of the neurotransmitter acetylcholine, it stimulates the synthesis of protein, and it affects the fluidity of biological membranes. The mechanisms are poorly understood, but we can nevertheless exploit them to alter the performance of our bodies and minds. Several of these ALC applications have been receiving much attention recently. Let’s look briefly at these. The first clinical study of ALC for treating Alzheimer’s Disease was reported in 1983.25 Wouldn’t you think that by now, a quarter of a century later, the medical world would have settled the question of whether or not this substance should be a standard weapon against this disease? Well, it hasn’t, for reasons that are controversial. Cynics claim that the medical profession downplays all dietary supplements because physicians are being bribed by the makers of prescription drugs. Others claim that mainstream medicine shies away from supplements because they give inconsistent results in human clinical trials — and that these trials of supplements are conducted sloppily, on low budgets, in contrast to prescription drugs, which are tested in high-budget trials. Since acetyl-L-carnitine enhances mitochondrial energy production, and since destructive free radicals are always a by-product of this process, it is important to scavenge these free radicals before they can damage the mitochondria and other cellular structures. The standard way to accomplish this scavenging is to use a second supplement — the antioxidant alpha-lipoic acid.40 A reasonable dosage would be 100 mg of alpha-lipoic acid three times per day. Anyone who is considering the use of ALC for treating or preventing Alzheimer’s, Parkinson’s, or other neurodegenerative disease, should also consider the simultaneous use of a curcumin-containing product like LifeLink’s Primeric™. The mechanism of action of curcumin is unrelated to that of ALC, which means that the combination may benefit from synergism. Are acetyl-L-carnitine supplements useful for the conditions and purposes mentioned above? We aren’t allowed to tell you, so you should take a look at some of the references cited here, and then decide for yourself.